This is our raw hummus recipe made using soaked nuts and seeds rather than the garbanzo beans used in many Middle Eastern recipes. Since a greater amount of the ingredients used when making hummus happen to be mostly raw to begin with, it is not too far off from the original versions. Here you'll be substituting the cooked beans and toasted tahini for raw walnuts, hemp seeds and raw sesame butter. 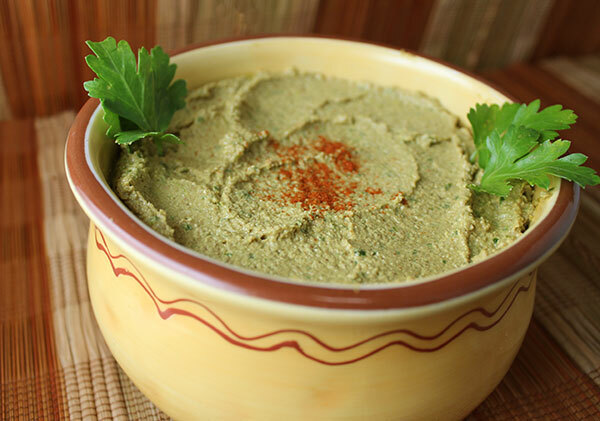 Hummus is one of the most popular spreads to consume for those adhering to a raw vegan diet because it's easy to make and convenient to have on hand in the fridge for making wraps or scooping onto a big green salad. It is likewise easy to travel with as a instant spread or dip for dehydrated crackers and assorted vegetables. 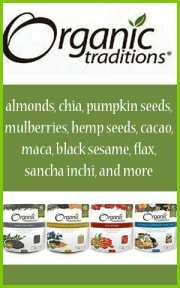 What About Using Sprouted Raw Garbanzo's? There are some raw vegan recipes who employ the use of sprouted garbanzo beans (or chickpeas) instead of nuts. We, however, are not big fans of sprouting beans like chickpea, pinto or black bean. One of the reasons for this is that all uncooked legumes contain a natural toxin called lectin and they are especially prevalent in these harder bean varieties. Sprouted peas, lentils or whole mung beans contain considerably less lectin content and are much preferred option for occasional consumption. We have found, from personal experience, that sprouted garbanzo's don't really taste all that great as well as being very difficult to digest. Garbanzo beans, even in their cooked state, can cause digestive disturbances for many people. The best way to consume any hard bean variety, in our opinion, is to cook and prepare them as a fermented food, like tempeh or homemade miso. That being said, we love to create delicious and savory hummus using primarily walnuts and a small portion of hemp seeds and hemp seed oil. We have experimented with many different combinations and this one produces the best hummus recipe as far as texture and flavor. Walnuts are a great choice for this dish, supplying omega fatty acids, protein, fiber and many amino acids. They are a heavy and dense nut, perfect for a rich paté-type dish. 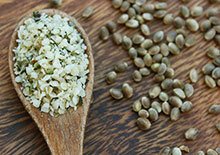 We also add in hemp seeds and hemp seed oil to add in more omega-3's as walnuts, tahini and olive oil are known to contain greater amounts of omega-6's. It is important to consume adequate proportions of omega-6 to omega-3 in the diet on a regular basis, ideally in a 4:1 ratio. 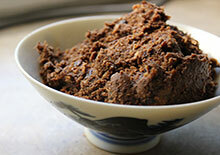 We do include a small amount of miso paste in this recipe, which is technically speaking a cooked food. 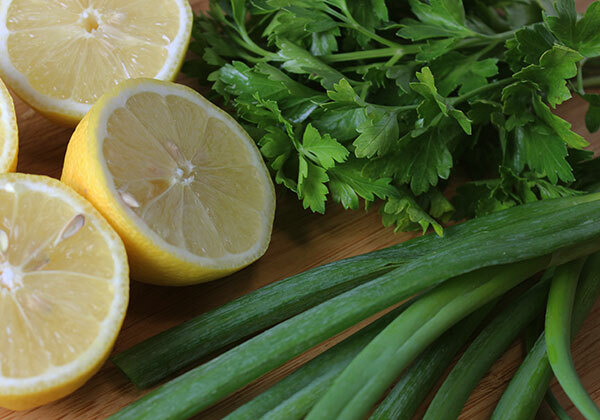 If you are following a 100% raw diet you might want to leave it out and add more sea salt. Miso is a fermented enzyme-rich food source and can help to break up the heavier dense nature of nuts and seeds. If you are looking for a lighter, low calorie version of hummus you can also use yellow squash or zucchini instead of walnuts. Or, try using a less oilier nut or seed variety, like almond or sunflower seed. 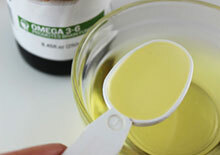 The olive oil content in this recipe can also be divided in half, substituting water in its place. This is an easy hummus recipe to make that takes less time to prepare because you don't need to cook the beans before hand. The only thing you need to remember ahead of time is to soak the walnuts overnight or at least 8 hours. Once you have all your ingredients the food processor does the rest of the work, creating a smooth and savory curried dip, spread or condiment. Soak the walnuts in pure water overnight, strain and rinse. 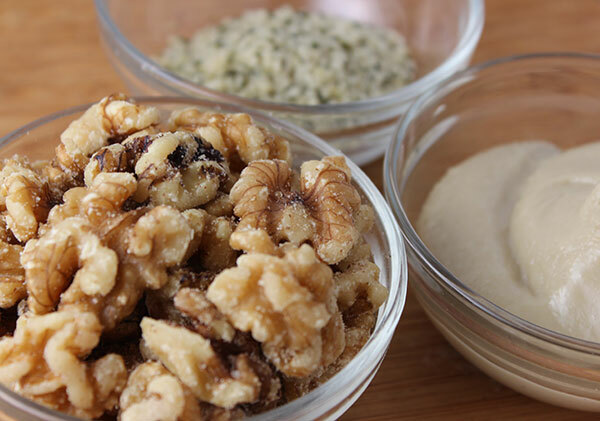 In a food processor, process the nuts, seeds, tahini and all dry ingredients. Next, add in the chopped parsley and onions. Lastly, add the olive oil, hemp seed oil and lemon juice. Process until smooth and hummus-like. Add some water if needed for best texture. The hummus will thicken slightly when chilled and usually lasts between 5-7 days or longer when stored appropriately. Enjoy as a satisfying snack on dehydrated crackers, as a salad or as a main meal with veggies and onion sprouts. This hummus recipe is delicious simply wrapped up in a collard leaf with cucumber, olives and sprouts. 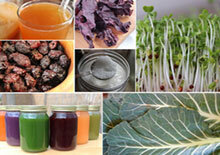 Also visit some of our other raw vegan recipes.